← First Runs, Second Runs, Flat Tops, Domes or Bar Stamps Anyone? Ever seen one of these??? Me neither. Once or twice a year, as the disc golf season gets back into gear, the major disc golf manufacturers will launch a signature disc. I suppose “Signature Disc” literally means it has someone’s signature on it, not necessarily a “Special Edition,” as many Signature Discs are identical to the regular version apart from their stamp. Ken Climo is the easiest example of having a Signature Disc, and the history behind all of Ken Climo’s discs, as well as plastic blends is a bit too vast to get into- but since he’s the Champ, it’s no surprise that he started it all. As discs become well known, and they are released in different runs and plastics, they are often referred to directly by their “signature name” as if the disc was designed by that player and are unique to that stamp… but this isn’t always the case. In this coming year, 2012, it’s safe to assume that Nate Doss will be getting a signature disc- as he was the winner of the 2011 World Championships. It’s also safe to assume that his disc will be something from Discraft- since he’s a Discraft sponsored player. Depending on how a player is sponsored, it’s possible for them to get flat rate ($0.15 cents as a random example) for each of their signature discs sold. Keeping this in mind, it makes the specific disc choice an interesting situation. Who decides which disc? Who decides which plastic? If the player, in this case Nate Doss, wants to maximize his paycheck and name-recognition, it’d be smartest to choose the Buzzz, in either ESP or Z blend plastic. I saw a brief mention of this choice (Nate Doss with the Discraft Buzzz) in some internet chatter last week, so I will not be surprised if this ends up being the case. On that same token, Nate is a big proponent of the Challenger putter as well, but Discraft has already worked up a one time only 500 disc batch of extra grippy and stiff Challengers with the Nate Doss logo stamp, so it would be odd for them to follow that up with an additional signature disc. In any case, 2011 certainly seemed to be the year of the Doss, as he won the National Tour title, the Worlds title, and also got a signature bag made as well (the Grip Equipment bag). So, Nate Doss aside, what are the other signature discs that you’ve come to know and love? Before I go into my personal disc collection, I want to mention a few others that I have come across- they are: the David Feldberg Innova Champion Boss, the Avery Jenkins Innova Star Destroyer, and the Nate Doss Discraft ESP Surge. Oddly enough, the only one of these that I’m familiar with at all is the Nate Doss Surge because I have a friend who throws them religiously. I have yet to meet someone who swears by the “Dave Feldberg Boss” or the “Avery Jenkins Destroyer,” but that could always change. When I look into my own disc collection, I find around eight different discs which bear a signature in the hot-stamp. The stand-out and favorite among them is probably my 12X Ken Climo Star Wraith. Ken Climo has at least six (maybe more?) different molds of Innova discs with his name on them (Teebird, Eagle, Wraith, Roc, Aviar, and Banshee off the top of my head) and the Star Wraith is a definite favorite of mine. This distance driver out performs every driver I throw on a daily basis, especially once it’s broken in. 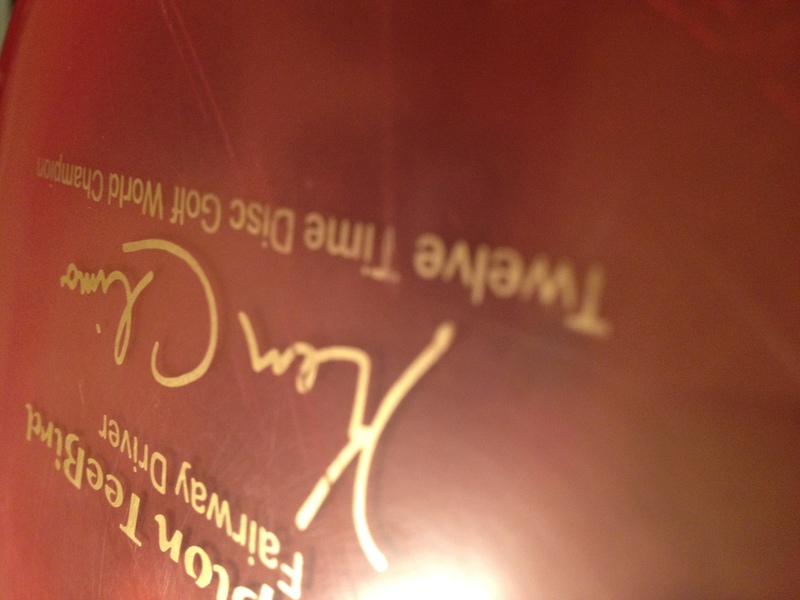 In other Ken Climo signature discs, his specific number of championships at that time helps determine a particular era when a disc was made. With the Teebirds, many folks prefer the 11X Teebirds, as the early ones can be “pearly” plastic, and they tend to be “flatter” topped in general. This kind of jibber-jabber is endless really. Is it domey? Is is KC Pro? Is it a 10X? Is it a 9X? While some of it is over kill, it DOES have a purpose, since each number refers to a particular year. If nothing else, when you’re holding an 11X Teebird, you know for a fact it wasn’t stamped after his 12X Teebird was released. 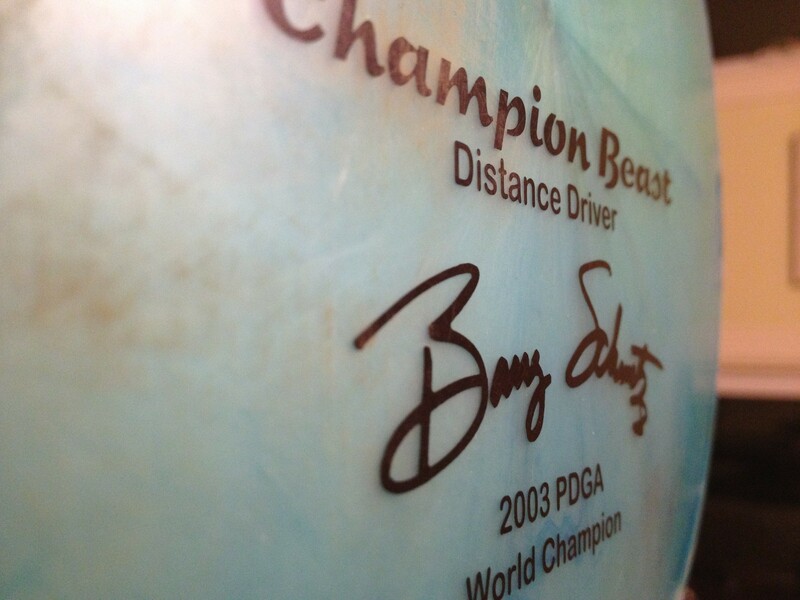 I also throw a Barry Schultz signature disc- the Champion Leopard. It doesn’t hold a candle to my CE Leopard, but since they are OOP (Out Of Production/Print) I can hardly hold this against him. It can perform miracles from a stand still, and it carves out some really nice anhyzers. I use a lightweight Leopard on throws where many people use a max weight Buzzz. Barry Schultz also has a Champion Beast, but the only Champion Beast I own is an old-school pearly one that has a gouge and is just a wall-hanger. Moving along, I also enjoy my Jesper Lundmark Latitude 64 Opto Striker. It is very similar to a Teebird, but I find that it’s a little faster. It can handle the wind very well, and can handle all the snap I can muster. Jesper (pronounced “Yes-per”) also has his name on the Latitude 64 Gold Line Halo in my bag. This is a disc I throw exclusively sidearm, and rely on it’s over-stable flight path for a left to right turn. In the end, I get a kick out of how a player’s name effects our attitudes towards it. The debate can be a “chicken or the egg” type of thing, since the discs were made before the pro player got his name on it. However, the image, attitude and persona of a professional disc golfer can affect our view of the disc. Without naming names, I can think of a couple of excellent professional players who could get their name on a disc, and most of my friends would not want to throw it. I hate to be abrupt, but this is one long article people! I’m guessing 1 in 2 people won’t even finish it!!! Next week we’ll do a part 2- I need to highlight a few other very important discs! Come back next Tuesday!!! This entry was posted in Equipment and Gear, Touring Pros and tagged disc, doss, golf, nate, signature, worlds. Bookmark the permalink.